The motto of the story is. Kill all that you can, we need to depopulate as quickly as possible. They don’t have to worry, no one will hold them accountable. 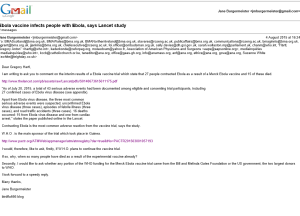 I have just sent an email (see screenshot) to WHO asking how they can justify an Ebola vaccine trial which is infecting people with Ebola and killing them according to the interim results published online in The Lancet. I also asked whether the BIll and Melinda Gates Foundation, as WHO’s second largest donor after the US government, funded any portion of this WHO trial in Guinea, which has infected 27 people with Ebola and killed 15, according to the study. Will keep you posted on any reply from WHO spokesman Gregory Hartl.